What is a BMS (Blockchain Management System)? In the world of CMS's, projects like WordPress and Drupal started as ways to let people without platform expertise easily organize content, starting with blogs but eventually much more. A Blockchain Management System, or BMS, like bPanel, aims to achieve in the world of blockchain interfaces what WordPress did for content, all while backed by the enterprise-level security and robustness of bcoin. Changing a few theme variables can have a big overall visual change to your bPanel. Compelling themes can come from just a few lines of code. Painlessly to create interactive UIs and manage state. Design simple views for each state and React will efficiently update and render just the right components. Built entirely around plugins. All visual elements can be extended via the plugin system by leveraging the composable nature of React and Redux. 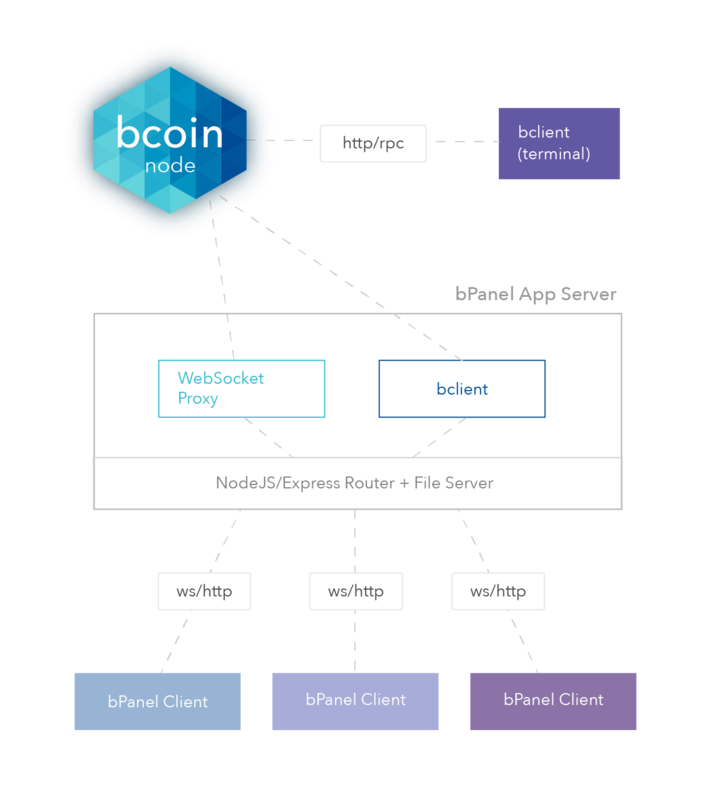 bPanel uses bcoin's native WebSocket implementation, bsock which is compatible with the Socket.io API. With bPanel, enjoy full access to everything the bcoin API has to offer. 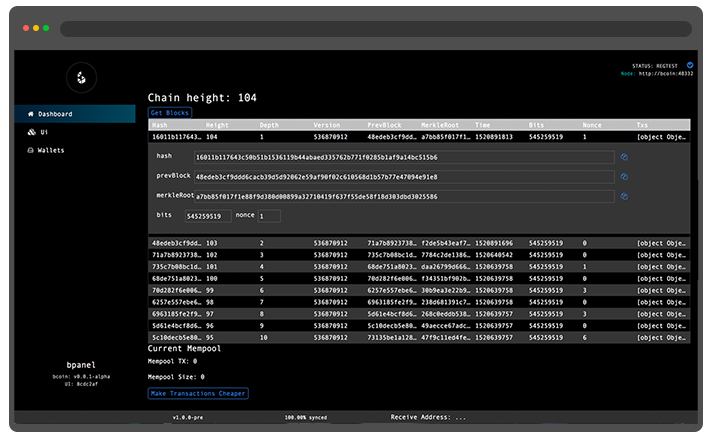 Manage HD wallets, send & receive, query block and tx information, organize UTXOs. Both bcoin and bPanel are Open Source. Fork, clone, copy and rebuild anything you like. Help us build, help yourself build, just build! With a standalone app server that acts as a proxy to your bcoin node using http requests and web sockets, you can configure your bpanel to point to anywhere you want. Bcoin is the trusted fullnode implementation built specifically for production systems at scale. 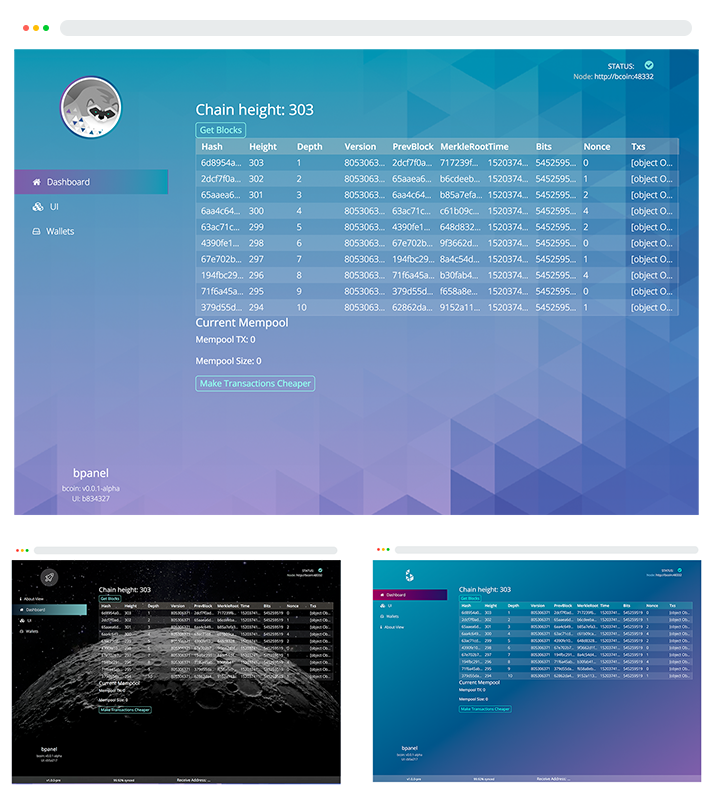 Anything bcoin can do, bPanel can do too! With bPanel, changing a few theme variables can have a big overall visual change to your bPanel, meaning that compelling themes can come from just a few lines of code. With bPanel's robust plugin system you can also extend the functionality of the app as much as you want. By leveraging the power of bcoin, anyone with front-end or React experience can dive in and begin building sophisticated applications on top of Bitcoin's blockchain. Here are some exciting ideas for things you can build. Look for these coming to a hackathon near you!